Product Description Style Name: Freezer-Refrigerator / Oven Freezer-Refrigerator Keep your frozen and refrigerated items at the proper temperature with this Freezer/Refrigerator Thermometer from Taylor. The extra-large, 3-1/4-inch dial features a glass lens and red pointer making it easy to read. This freezer/refrigerator thermometer has a range of -20degrees Fahrenheit to 80 degrees Fahrenheit. Colorful blue and yellow graphics with safe temperature zone indicators ensure your food is kept at the proper temperature range. Oven. Oven temperature can vary from top to bottom and sided to side. 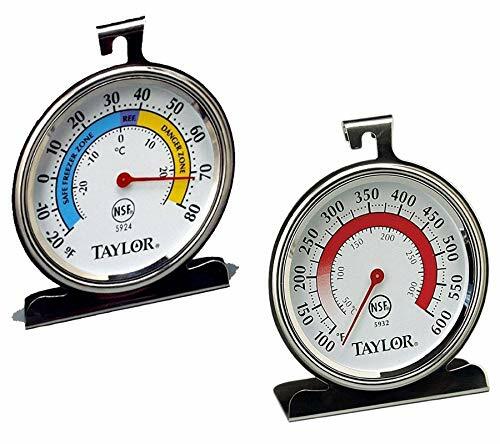 Ensure cooking at the proper temperature with this Oven Thermometer from Taylor. An extra-large, colorful, 3-1/4-inch dial makes this oven thermometer easy to read. The temperature ranges from 100 degrees to 600 degrees Fahrenheit. The dial features a glass lens with a red pointer to indicate temperature. Stainless-steel construction provides strength, durability, and corrosion resistance. This unique design can be hung from a rack or stand on it's own. The Oven temperature ranges from 100 degrees to 600 degrees Fahrenheit. Digital Kitchen Timer,Super Strong Magnetic Back,Stainless Steel Shell,Large Display,Loud Alarm,Professional Minute Second Count Up and Countdown Timers for Cooking Sports Games.